Thank you for seeing Tom regarding his broken tooth. He does not trust anyone but you to take care of his teeth. Probably not too many people look forward to a visit to the dentist. And most likely, even fewer drive over 200 miles round trip for the privilege. Like most kids growing up in the 50’s, a trip to the dentist was filled with dread and terror. This resulted in years of neglect and sub-par dental care. Fortunately for me, while in High School a new dentist opened a practice right across the street from the school. I heard about Dr. Mattie from the athletes in our school all of whom who had occasion to visit Dr. Mattie due to injuries incurred on the field. High school boys “raving” about this great new dentist really caught my attention. I swallowed my fear and made my first appointment. That was over 50 years ago. When I moved from Connecticut to New Jersey it never even occurred to me to find a new dentist. I remember Dr. Mike asking me many years ago “What are you going to do when Dad retires?” Without hesitation I responded, “Why come to you, of course.” And that’s exactly what I did. In today’s era of big business medicine you’ll get something special with Dr. Mike - a top notch professional truly committed to knowing and treating his patients as unique individuals. Fifty years after my first visit, I continue to look forward to my twice annual visits to Dr. Mike. It’s like visiting family. Dr. Mattie has been my dentist for many years. Sadly I was not blessed with good teeth, and Dr. Mattie has done some remarkable good work on me. I have been treated with great care and understanding. He has been responsive to my emergency visit requests and been diligent to see my problem teeth fixed and maintained . He has my highest recommendation. Dr. Mattie makes going to the dentist a non-fearful experience. 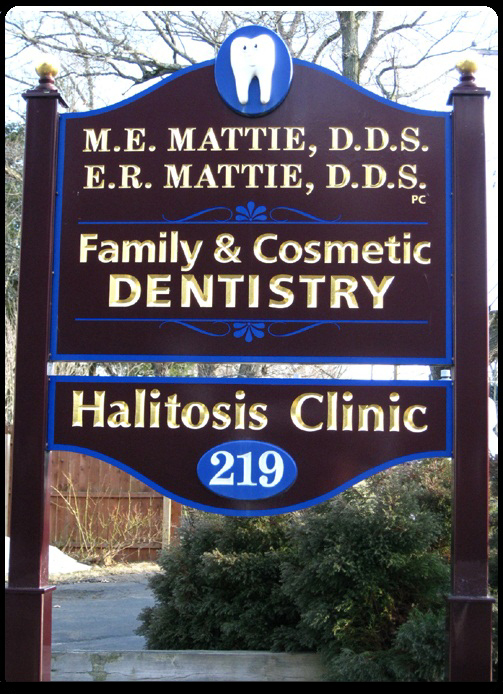 For anyone who is embarrassed about going to the dentist because its been a while, or anyone who might fear pain - Dr. Mattie is the perfect dentist because he is gentle and always goes above and beyond to make you feel comfortable while in the chair getting any procedure done. What I like most about Dr. Mattie is the personal touch he adds to your dentist visit. This is lost in a lot of today's professional practices. He is also very flexible with scheduling and I never wait more than two minutes in the waiting room - which great! I definitely recommend giving him a try! I knew from previous experience that playing a musical instrument puts extra stress on the front teeth; but when a front tooth fractured before a concert, Dr. Mattie saved my tooth that day. Knowing well that I play a woodwind instrument, he recommended a future crown of special design to prevent fracturing. Well, here I am several years later still enjoying my clarinet and my tooth crown is perfect. Thanks Doc for a musician's second chance at life and a job well done. Having been with Dr Mattie in the past, my husband and I commute from North Florida to see Dr Mattie in the summer as we do not trust the dentists in Florida. Down there, procedures are "a la carte" and often unnecessary as we have been told. So when my husband had his bridge done by Dr Mattie and I had some other work as well, we were thrilled that he could do it. Kudos for your honesty Dr Mattie; our teeth never felt so good !! I was refered to Dr Mattie by friends because I was looking for a dentist that I could entrust to help save my painful back tooth. Having had previous experiences that were not pleasant, I must say that Dr Mattie was very efficient at getting me out of pain. I was concerned with what procedure was required to save the tooth and so he took extra time to explain it to me. This helped ease my concern greatly. If I had a question about something, he always addressed it directly. I now have a fixed tooth and am very confident with his treatment recommendations. It's a comfort to know someone who will listen and explain things to me. Had an extremely painful toothache suddenly one day. Dr. Mike saw me immediately. I like the quiet family environment and friendly staff of this dental practice. Thank you for seeing me after normal business hours before my trip to Florida... not every dentist takes interest in their patient's well being at that time. Your expertise helped save my molar. Dr. Mattie, you are the only one who granted me the freedom from fear of the dentist. I had ignored my teeth for years and was in a lot of pain. I called your office and without delay you were willing to see me; within one visit you corrected the problem. Thanks to you and your staff, you are an asset to North Haven.